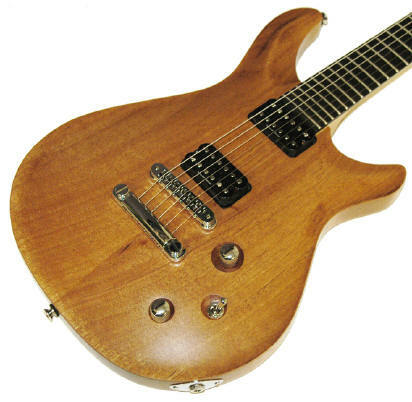 Mahogany is Traditionally Used on PRS, Gibson, and Many Other Corporate Brands of Guitars. I have surmised that Mahogany is not very consistent sounding, Some Mahogany tends to sound much better than other Mahogany. It probably has to do with age. If you listen to an early 80's PRS they will typically sound much better than the newer ones. When production was limited, Paul didn't have to buy lumber in tonnage. He would carefully seek out choice wood and then take the extra time to match it tonally to the tops. We don't use a lot of Mahogany, But when we do we use only the best hand selected material we can find. We are using quite a bit of mahogany at this time, I have done a lot of research and I have found sources for extra light resonant mahogany. Mahogany like Korina improves with age tonally. The age theory does not always hold up. and I still could tell a huge difference. Currently I build mostly higher priced custom guitars & I don't get too much call Mahogany. Korina is much harder to work with because it is more porous. It is precisely those pores that give Korina it superior tonality and blooming capabilities. Mahogany is a porous, but strong wood which is easy to machine and finish. It has a spiraling and interlocking grain pattern which makes it a very stable wood. 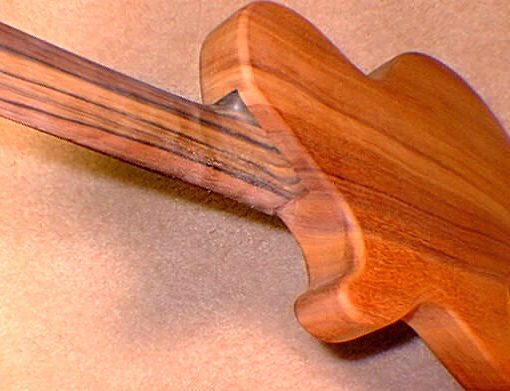 Honduran Mahogany is the favorite choice of instrument builders, but is very hard to find. African and Spanish mahoganies are often used as a replacement for Honduran Mahogany. Light to moderately heavy wood with smooth attack and rich singing sustain [when used as body material]. When it's very heavy, the wood losses the warm round attributes. 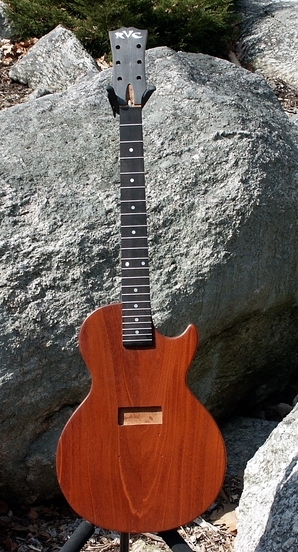 The Quicksilver is a classic example of a mahogany body capped with a maple top. At least on the lower cost models. Color is yellow to reddish-brown. Grain is interlocked with a stripe or roey figure. Texture is typically medium to coarse, with a natural luster The timber is reported to polish to yield and excellent finish. African mahogany is reported to take stains well. Uses include boat building, cabinetmaking, decorative veneer, furniture. Specific Gravity is .44 (medium density). Requires sharp tools. Fender uses the Honduran variety on their set-neck series [as body material]; provides a moderate to heavy weight (body weight at least 5 lb.) with a warm, full sound and good sustain; used in conjunction with a maple top to add brightness. Swietenia macrophylla, from the Family Meliaceae it grows from Southern Mexico southward to Colombia, Venezuela, and parts of the upper Amazon and its tributaries in Peru, Bolivia, and Brazil. Plantations have been established within its natural range and elsewhere. Honduran Mahogany is reddish, pinkish, salmon colored, or yellowish when fresh; deepening with age to deep rich red or brown. Texture rather fine to coarse; grain straight to roey, wavy, or curly, often with an attractive figure. Basic specific gravity 0.40 to 0.68 averaging around 0.60. The wood can be air-seasoned and kiln-dried easily without appreciable warping or checking. Movement after manufacture is rated as small. Very easy to work with hand and machine tools, Easy to finish and takes an excellent polish. Long used in fine furniture and cabinet making, interior trim, paneling, fancy veneers, boat building, pattern making, turnery, and carving. Often called the queen of woods because of its working properties. 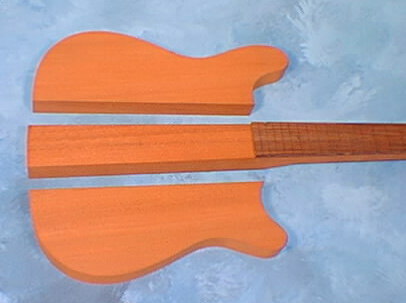 It is the most common timber used in acoustic guitars for their sides, backs, and necks. Medium weight and resonant, we use this timber for out body wings. Nice and lightweight, this wood is good for bodies, laminates and necks. We use Honduran Mahogany, This is a fine wood with good musical properties, the tone is warm and full with good sustain. Weight-wise, mahogany is mid to heavy with a Strat body averaging 5 lbs. or more. The grain is easy to fill although not particularly good looking for clear finishes.